Our 825W off-grid starter kit contains all the component parts for the solar power system. 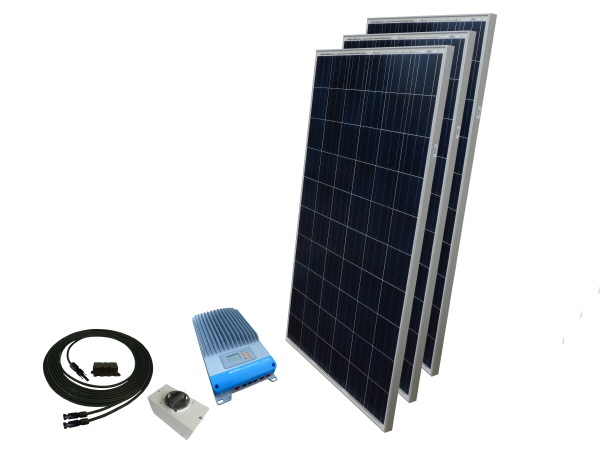 Included are three high performance 275W solar panels, cables, connectors, fuse and fuse holder a DC switch and a state of the art MPPT solar controller. Applications for our 48V off-grid solar systems include, remote location homes in the UK and abroad, home office, summer houses, workshops, static caravans, stables and outbuildings. Using the power of the sun and a state of art MPPT controller that intelligently regulates the working voltage of the solar panel this system can deliver approximately 68Ah on a 48V system per day during the summer months. This kit is ideal for customers who already possess at least 4 x 12 VDC batteries, if required batteries and power inverters can be added to the cart from the Often purchased together items.